Frugal and Thankful: My next big project. In January, when the whole country was suffering from cold temperatures and crazy snowstorms, we had drought and fairly mild weather. We had literally not a snowflake pretty much through the whole month. But winter is back. Definitely. It's been snowing for the past two days, and will keep going on and off all week. So we are kind of stuck at home. So in the next two months Hubby and I will be transforming this room top to bottom. Honestly, I always hated it. It's pretty small and dark, with low ceilings. There is not much we can do about the ceiling but we can change many other things to make it more functional for both them and us because, even though this place is small, it still has to serve many purposes. We decided on a budget of $900. I know it sounds like a lot of money but it's not. Because, first, we need to replace that sad futon. It served us well for the past eight years but it's time for it to go. It's old and, definitely, not a good fit for two not very healthy parents. 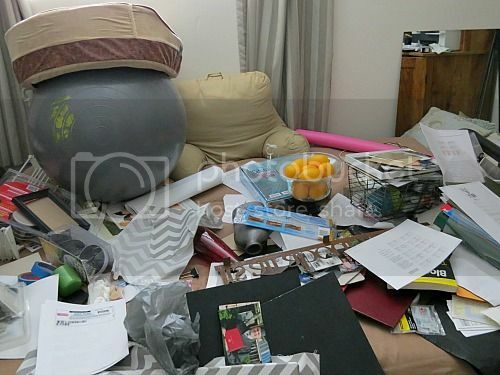 Good luck with getting your room cleaned up for your parents! My craft room downstairs is always always the messiest room in the house. All the random stuff gets dumped there. But yes, winter can be boring, so I should be cleaning up my junk room too! There's a futon under there?? LOL! Not so long ago my whole house looked like that! I'm gradually getting rid of the clutter. I'm sure your guest room will look wonderful and inviting once you're done redoing it - and you can't go wrong with Ikea! Great job! I love that futon! Can't wait to see the transformation. I have a room that looks just like yours! I am looking forward to seeing the transformation. Great news that your mum is recovering hope your dad is ok. Our spare room is much wore than that, I had two clear outs last year and it's still bad. 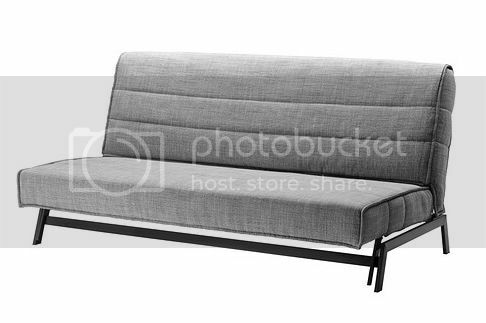 The sofa bed looks lovely and I'm sure you will find a way of not paying full price, you have a great knack of doing so. Can't wait to see the room finished. Having visitors is always a good incentive to clean up. Can't wait to see what you come up with to make this small room comfortable and still fulfill all of it's needed duties. And that's good news about your mother. I have a "scary room" - nuff said! Oh great you have an Ikea close to you!